Provide a little inspiration to your vegetarian friend that loves to cook with a set of Foodie Dice. This set of foodie dice comes packaged in an attractive glass tumbler with a cork lid, perfect for storing on a shelf or displaying on the kitchen counter. One thing to note is that the dice themselves are not particularly large — they measure just slightly larger than the size of regular game dice. A few people have been disappointed over the size, expecting larger, jumbo dice. In general, though, gift-givers and recipients alike find the set to be well-packaged and the handcrafted dice to be well-made and attractive. If you’re looking for a gift to give a vegetarian with a sense of humor, consider this witty yet practical kitchen apron. The bright red or dark green apron is emblazoned with a play on the familiar ‘Keep Calm and Carry On’ slogan: Romaine Calm Lettuce Carrot On. The fun phrase is accented with icons of romaine, lettuce, and carrots — making its veggie theme immediately apparent. The apron itself features two functional pockets that any cook can appreciate, as well as an adjustable neck. 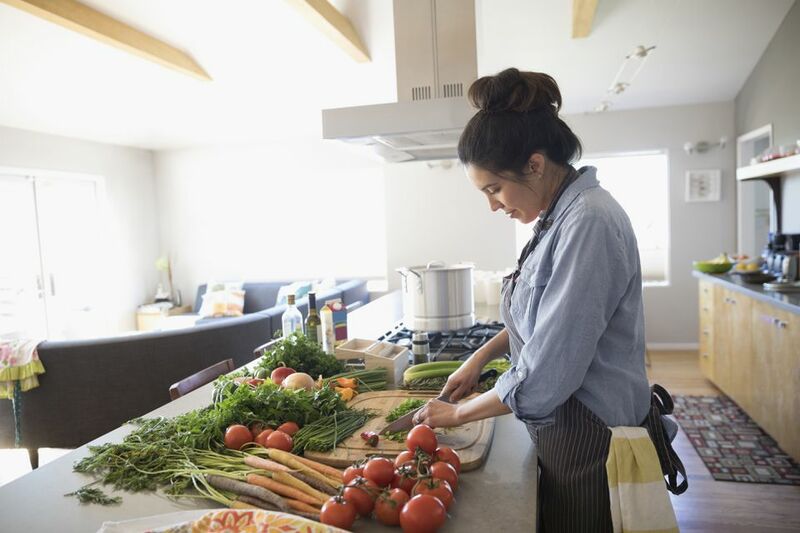 While a few people found the apron to be on the small side and a little too thin of material, most reviewers said it fit well and the lightweight cotton material was perfect for cooking. To bring a smile to the face of your vegetarian friend, give them this ‘Romaine Calm’ apron. A hardcover cookbook with an exclusive focus on vegetables makes an excellent gift, particularly for new vegetarians. The Vegetable Butcher by Cara Mangini is a popular choice for a gift-worthy cookbook. This book is part vegetable prep guide and part recipe treasure trove – making it an excellent overview of how to select and cook all kinds of vegetables. The author explains how to select the best of each variety, how to properly cut each vegetable, and what to pair them with. Readers find the included recipes to be creative, yet with accessible ingredients that aren’t too hard to find. This book makes a great gift for the ‘vegetable butcher’ in your life, and has beautiful, illustrative photos that anyone can appreciate — vegetarian or not! If you want to buy a gift for a vegetarian with a green thumb, an herb growing kit makes a fragrant and tasty gift. The Planters’ Choice Organic Herb Growing Kit is our top recommendation. This kit includes everything needed to start growing four popular herbs — cilantro, parsley, basil and chives. Simply follow the included instructions, add water, and wait for the seeds to sprout! One thing to note is that the herbs will need to be transferred out of the biodegradable starter pots once they grow larger. Many people have given the Planters’ Choice Organic Herb Growing Kit as a gift, and it has been well-received. A few people had difficulty getting their seeds to sprout, but many factors can have a bearing on whether or not the seeds are successfully started. One bonus included with this kit is an herb grinder that comes in handy when it’s time to harvest the herbs. Overall, this herb growing kit makes a great gift a vegetarian that likes to cook with fresh herbs. Take some of the prep work out of vegetable slicing and spiralizing with the Spiralizer 5-Blade Vegetable Slicer. Any vegetarian who enjoys making zucchini noodles, beet spirals and more will appreciate this useful kitchen utensil as a gift. The Spiralizer Vegetable Slicer is a countertop version, which takes up more space than handheld slicers and spiralizers. However, most people find that this model is much easier to use and doesn’t require so much force compared to handheld spiralizers. Included with the Spiralizer Vegetable Slicer are 5 high-quality stainless-steel blades that safely store away underneath the slicer when not in use. This slicer has earned rave reviews for its ability to make quick work of spiralizing zucchini, slicing roots such as ginger and daikon, and cutting even firm butternut squash. Want to take a look at some other options? See our guide to the best spiralizers. If you want to send a gift box filled with tasty meatless snacks, choose the Bunny James Vegan Snacks Care Package. Filled with savory and sweet treats, it will tickle the taste buds of vegetarians and vegans alike. The Bunny James snack box is filled with 20 full-sized items and represents a great value. The box is perfect for a variety of occasions, and everyone from college students living on campus to busy moms will appreciate having a variety of vegetarian-friendly and tasty snacks delivered to their door. The Vegan Snacks Care Package is also a great way to explore new snack options. People love the mix included with this box, as there are both sweet and salty choices included. If you want to send a gift box to a vegetarian, make it the Bunny James Vegan Snacks Care Package. Eggs are a great source of protein, but boiling just a few eggs on the stove seems like a waste of water and energy. This handy device will soft- or hard-boil up to four eggs in the microwave, with easy-to-peel results every time. This is dishwasher safe for easy cleaning but is simple to rinse clean, since it’s just holding water. With the price, this makes a great stocking stuffer for your vegetarian friend. Want to take a look at some other options? See our guide to the best egg cookers. Sprouts are a healthy addition to salads and sandwiches and we're sure your vegetarian friend eats a lot of them. Sure, they can be bought in a grocery store, but growing them at home is more convenient, and you always know the sprouts are fresh and clean. It only takes a few days to have fresh sprouts, so you can grow a variety of sprouts, including those that aren’t quite as popular at the grocer. This sprouting kit includes a jar and three different mesh-filter growing caps, so you can change the caps for different-sized seeds, or for different stages of the growth process. When the sprouts are large enough, the largest-mesh cap lets you rinse the sprouts in the jar and drain the husks away. The lids also fit on standard canning jars, so you can keep several jars in process at all times. The company also sells seeds and mixes, or you can buy them from your local garden center or online. Sure, you can put a plate on top of a block of tofu, then add a couple cans to add weight, but that’s not the best way to press tofu if shows up often on the menu. This press makes the process faster and easier, and it presses the tofu evenly for better marinating and cooking. Stainless steel springs provide the tension to press the tofu and squeeze out excess liquid, while another set of springs keeps the press open for inserting the tofu. Just turn the knobs to apply pressure and the water drains in 15 minutes or less, so the tofu will be ready in no time. All metal parts are food-safe stainless steel, with food safe custom-molded HDPE plastic plates to reduce cost and weight and provide a firm grip on the tofu. Plastic feet keep the press stable and protect surfaces from scratches from the metal bolts. This is top-rack dishwasher safe for easy cleaning. When it’s grilling season, vegetarians won’t feel left behind when this roasting rack for jalapenos is sitting happily on the grill. The included coring tool makes it simple to remove the pesky ribs and seeds, then the peppers stand neatly upright on the rack for stuffing with grains, cheese, tofu, or any tasty veggie mix. Then just grill them to make a tasty snack, filling for a taco, or a spicy addition to a salad. This holds 24 jalapenos (or other similar-sized foods), so it’s great for a crowd, or make lots of extras for leftovers. This can be used in a smoker to add that special flavor to the peppers and filling, and when grilling season is over, this can be used in the oven as well. This is made from stainless steel and is dishwasher safe for easy cleaning.